Safe sailing is ensured through a sophisticated combination of high-performance radar/ARPA, ECDIS, Conning display, and centralized management of critical alarms. State-of-the-art design enables one-man bridge operation, for unsurpassed economy. 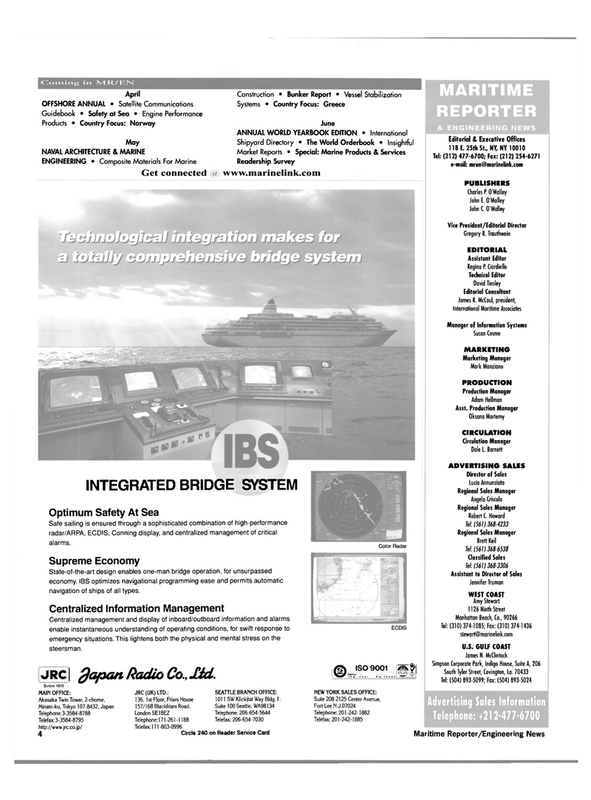 IBS optimizes navigational programming ease and permits automatic navigation of ships of all types. Centralized management and display of inboard/outboard information and alarms enable instantaneous understanding of operating conditions, for swift response to emergency situations. This lightens both the physical and mental stress on the steersman. JRC] flapon Radio Co., JUd. ECDIS ©ISO 9001 |Sj$| J Q A - 0 5 9 1 FM 3 0 2 4 9L'—"